Getting into March is the perfect time to start thinking about healthy and delicious snacks for St. Patrick’s Day. While it is a celebrated holiday, there is no reason to fall short of wholesome expectations for family meals. With the rise of great new grocery stores bursting with healthy alternatives to most common ingredients, we get to ‘have our cake and eat it too’! The truth is that keeping with St. Patrick’s tradition does mean exercising some restraint. It was only after a relatively heated debate within the Roman Catholic church that over 80 dioceses provided dispensations for practicing Catholics to eat corned beef on Friday of last year (March 17)–because the holiday falls within Lent. Historical exemptions have occurred for the holiday throughout the years, partially explaining why the day has come to represent a time of excess. There’s a right way to celebrate that idea without going overboard–and that means good cooking. 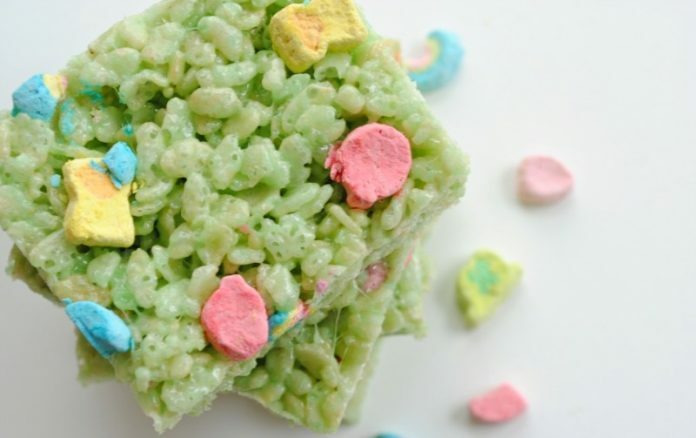 We found some amazing recipes to share that keep it healthy while sticking to the spirit of St. Patty’s. Real old-fashioned colcannon is a vegetable treat made from potatoes and cabbage. 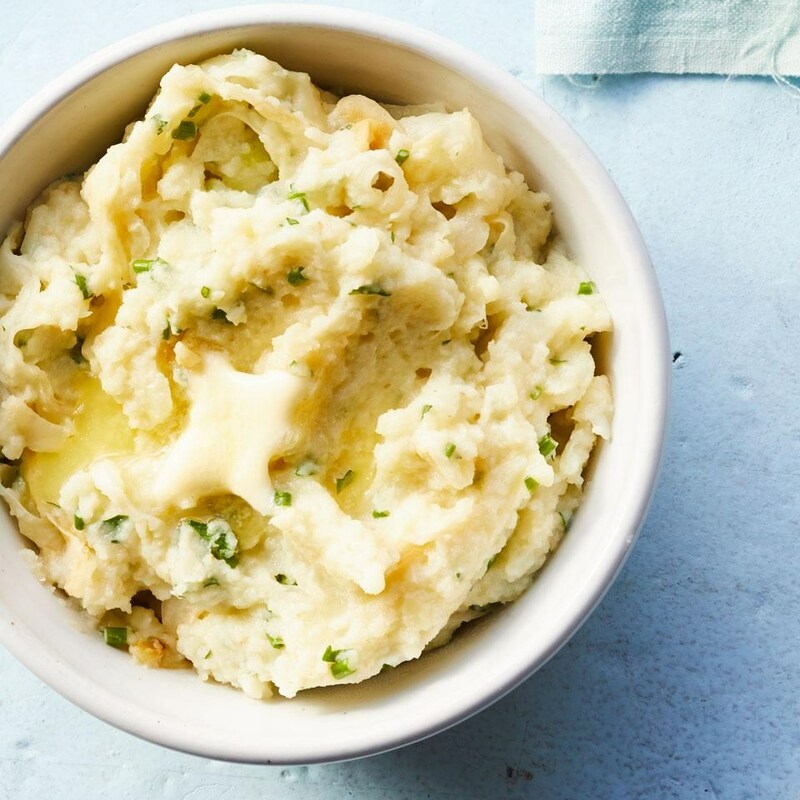 In this healthy approach to a colcannon mix, we exchange in (extremely flavorful!) celery root for the customary potato in the Irish dish as well as use less butter than usually found in it to reduce overall calorie count by more than 200 per serving. Boil your water in your large saucepan. Add some celery root and garlic, then cook until tender. Should take approximately 15 minutes before you drain. Concurrently, you will want to heat up some oil in a skillet. Now add your cabbage along with ¼ teaspoon salt and cook until tender and light brown in spots, 8 to 10 minutes. Remove from heat and cover. Move your celery root and garlic over to a food processor, then put your pinch of salt, the reduced-fat milk, butter and pepper in. Then puree the contents until smooth. Scrape over into a large bowl where you’ll then stir in your cabbage. 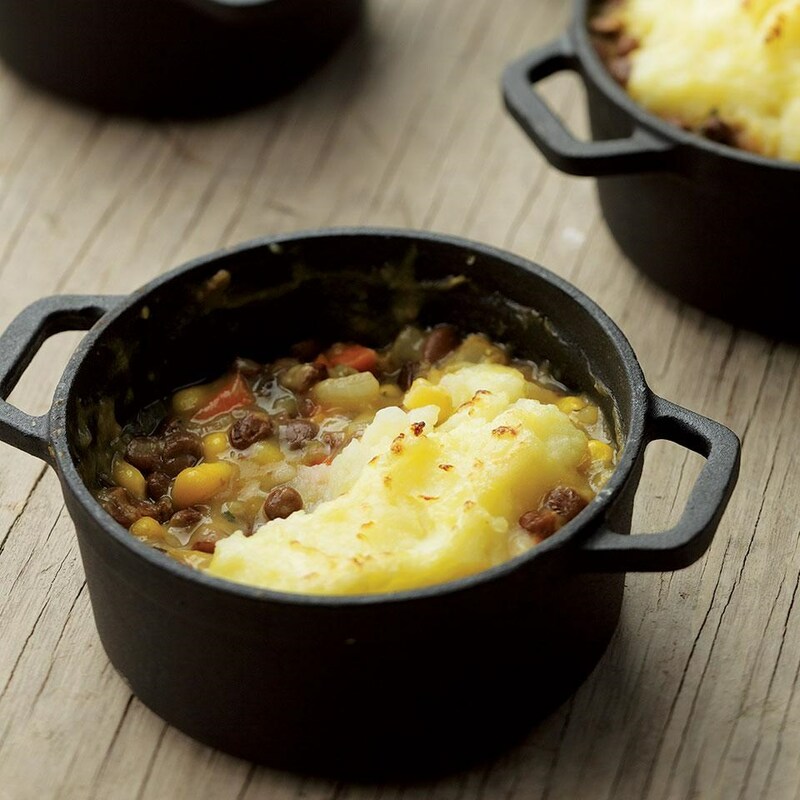 These mini vegetarian shepherd’s pies have carrots, corn, and lentils topped with a great mashed potato mixture. We humbly suggest serving this delectable dish alongside spinach salad and red-wine vinaigrette. Note that you can also make this in a casserole dish. Put your potatoes into a sizeable saucepan, then add water until you have about 2 inches over them. Stick to medium-high heat and get this to a simmer. Then lower your heat down to medium, cover the saucepan part way, then continue cooking until contents are tender This should take about 15 minutes or so. Then you’re going to want to drain the saucepan and put the potatoes back in. Add your buttermilk, the butter, along with ¼ teaspoon of both salt and pepper (each). Mash it well until the contents are primarily smoothed. While your potatoes are cooking, position rack in upper third of oven; preheat broiler. Coat four 10- to 12-ounce broiler-safe ramekins (or an 8-inch-square broiler-safe baking dish) with cooking spray. Place ramekins on a broiler-safe baking sheet. 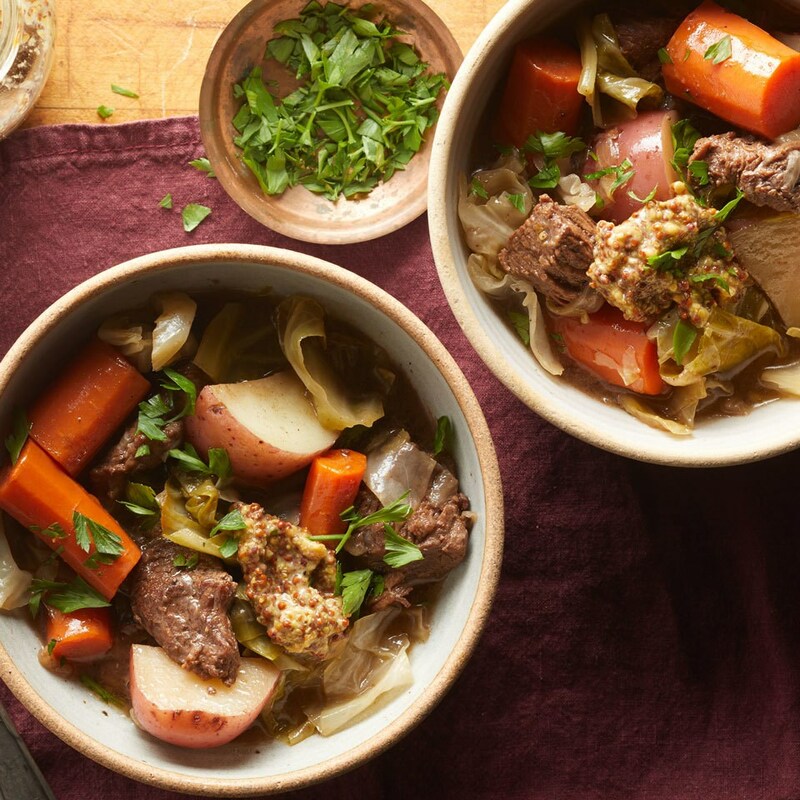 This slow-cooked beef stew contains all the essential flavor of a traditional Irish corned beef and cabbage, without all of the usual excess sodium. 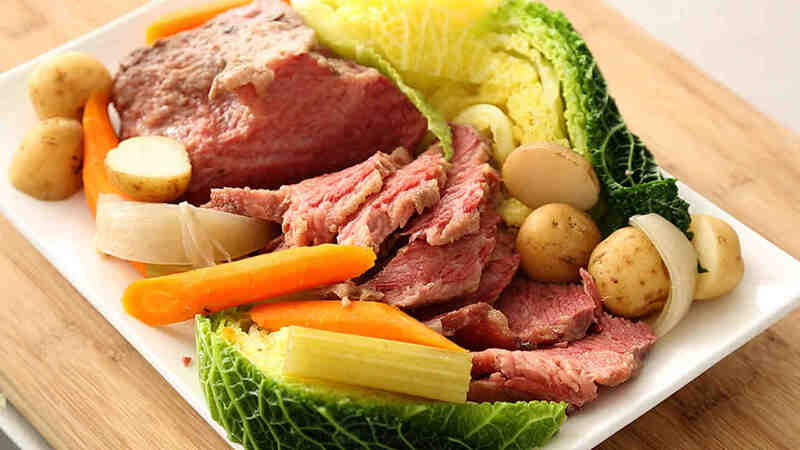 As an added bonus, it can be prepared in about half the time you could expect for a traditional corned beef and cabbage. Instead of spending a day curing your beef in brine, we opt to simply toss all of the beef and vegetables in a crock pot along with pickling spice to get the desirable salty flavor without having to soak for an extended period. Work smarter, not harder! Place your beef, pickling spice, and salt in a bowl (Make sure that the beef is well coated in both). With medium-high heat, warm oil in a skillet. Add your beef plus onions to the skillet, and cook until the beef is browned on every side (stir occasionally to get an even cook). This should take from 7 to 10 minutes. Now put your vegetable broth in and bring all of the contents to a simmer; be diligent about stirring and scraping up any browned beef or veggies off the bottom. This should take about 5 minutes. Once done, move everything to a slow cooker. In the slow cooker, add your carrots and potatoes to the beef while stirring. Now you’ll want to cook on High for 3 hours (or Low for 6). Add your cabbage, depositing it around the beef and vegetables. Cover your slow cooker for another hour on High (2 on Low) until all of the beef and vegetables are good and tender. Then stir in your vinegar to taste. Every serving should be garnished with about 1 tablespoon of parsley as well as 1 tablespoon of mustard. This amazing dessert can’t be beat for St. Patty’s enjoyment. It’s a quick soda bread recipe, best for digging into the day it’s prepared. We recommend adding some butter and your favored jam for added scrumptious flavor. While Irish soda bread is customarily prepared with wheat flour and demands a gentle touch to avoid gluten development, we’re preparing with gluten-free dough. So it should be thoroughly beaten (ideally with a stand mixer). Whisk your 1½ cups of buttermilk, egg, along with 3 of your 4 butter tablespoons in a bowl. Put your flour, baking powder, baking soda, as well as salt into a stand mixer. Mix these ingredients on a low speed until they are combined. Up the speed of the stand mixer to medium as you add your whisked buttermilk mixture from the bowl until formation of a soft dough. Once you have your dough, allow it to rest for about 10 minutes. With an 8-inch cast-iron skillet, use your remaining tablespoon of butter to brush the base as well as partially up the sides. Now form your dough into a ball with your hands (pre-dusted with extra flour). Firmly press your dough into your cast-iron skillet over the butter. Remember to be rough on it, it’s gluten-free. With a sharp knife fit to the task, cut a deep ‘X’ into the top of your dough. 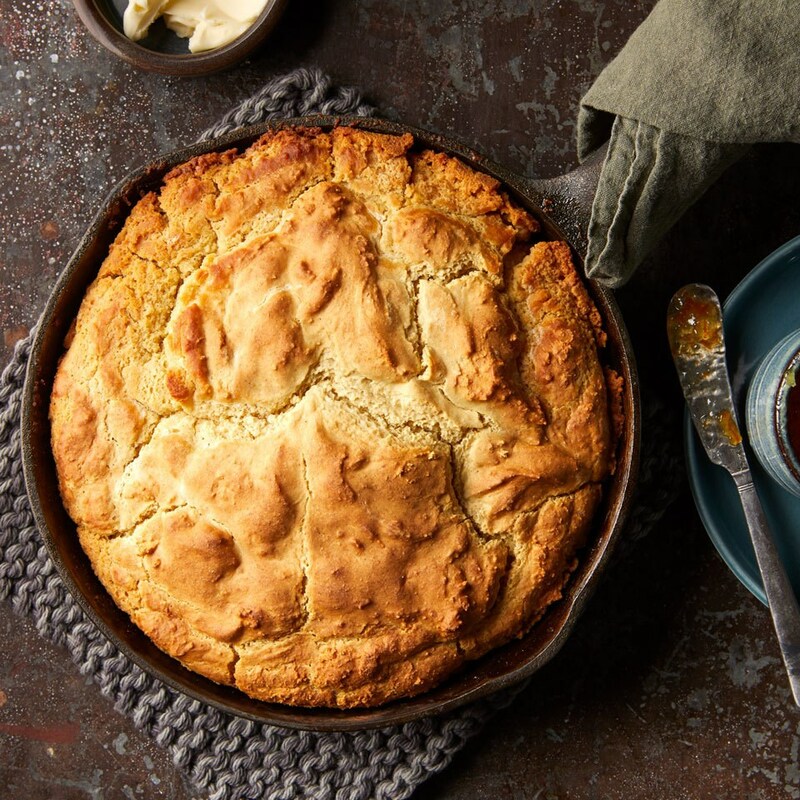 Bake your skillet of dough until the bread is browned. Tapping on the bottom of your pan should produce a hollow sound–it should take about 30 or 40 minutes at 400°F. Let your pan of bread cool for another 30 minutes or so once done.